Native of Africa, Asia, and Europe. Introduced and naturalized in North America. Dry to moderate moisture. Fields, meadows, roadsides, and other disturbed areas. Full sun. 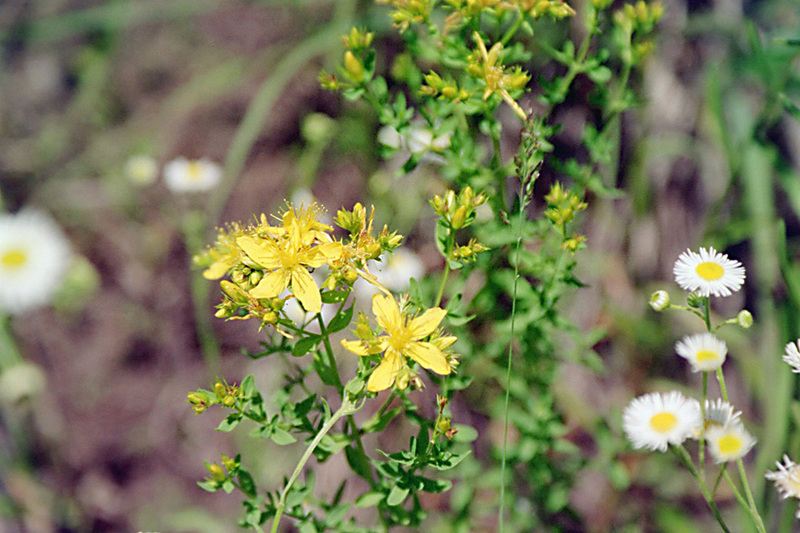 This is an erect, perennial forb that rises on multiple stems from a woody rhizome. It can be 8″ to 32″ in height but is usually no more than 24″ tall. 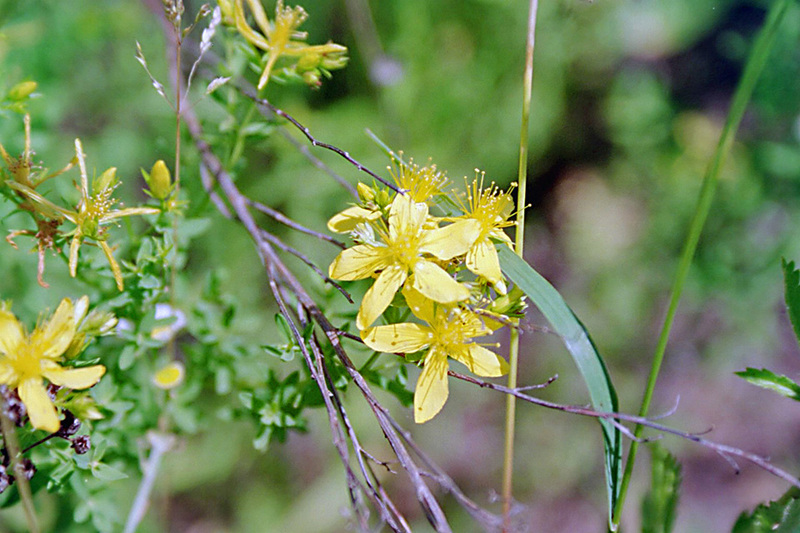 The stems are erect, hairless, leafy, and frequently branched, especially above the middle. They are strongly angled and have two small longitudinal ridges and a few black glands on the ridges. They are light green, sometimes tinged with red. The branches are very leafy and are sharply ridged below the base of each leaf. Each pair of opposite branches is at right angles to the branches above and below. The leaves are opposite, linear-oblong, thickly papery, and stalkless or nearly stalkless. Leaves on the main stem are ¾″ to 1¼″ long, and up to ⅝″ wide. Leaves on the branches are about half as large. They are rounded to almost squared off at the tip and sometimes have a notch at the tip. 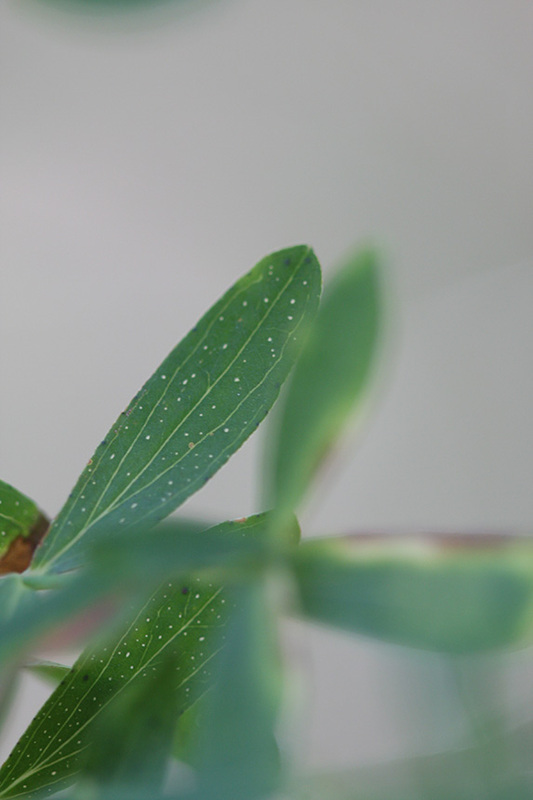 They are dotted with translucent glands visible when the leaf is held up to light. The upper surface is hairless. The lower surface is hairless and is dotted with many black glands. Between larger black glands there are numerous small, pale, transluscent spots. The margins are untoothed and dotted with many black glands. The inflorescence is a branched cluster of 3 to many flowers rising from 1 to 3 nodes at the end of the stem and up to 15 or more curved flowering branches rising from nodes below. The terminal clusters together with the curved flowering branches form a large, nearly flat-topped, broadly pyramid-shaped, or cylinder-shaped array (cyme). Each flower is subtended by a ⅛″ to ¼″ long modified leaf (bract). The flowers are ⅝″ to 1″ in diameter. There are 5 sepals, 5 petals, 40 to 60 stamens, and 3 styles. The sepals are green, narrowly lance-shaped to linear, ⅛″ to 3 ⁄16″ long, and 1⁄32″ to 1 ⁄16″ wide. They gradually taper with concave sides to a sharply pointed tip (acuminate). They are erect in bud, bent backward in flower. They have few if any black glands. The petals are yellow, oblong to elliptic, asymmetric, ¼″ to ⅝″ long, and 3 ⁄16″ to ¼″ wide. They have black dots (glands) near the margin, especially near the tip. They shrivel and turn brown but remain attached as the fruit develops. The stamens are in 3 groups. The longest stamens are ½ to ¾ as long as the petals. The anthers are yellow. The styles are ⅛″ to ¼″ long and are narrowly to broadly spreading. The stigmas are often reddish. The fruit is an egg-shaped, ⅛″ to ¼″ long, ⅛″ to 3 ⁄16″ wide, 3-chambered capsule with numerous seeds. 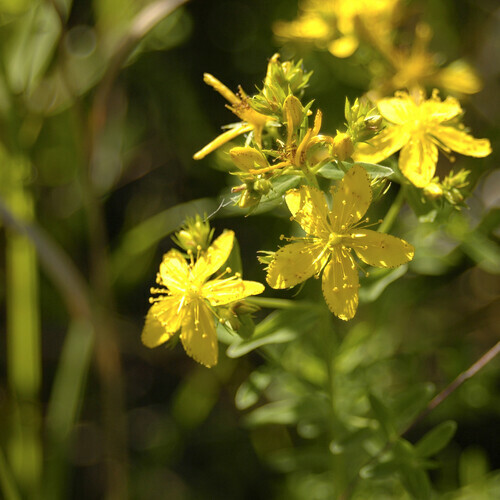 Spotted St. Johnswort (Hypericum punctatum) is a taller plant, up to 40″ tall, and is less branched. The stems are round, not angled or ridged. The branches are not ridged below the base of each leaf. The leaves are larger, up to 2⅜″ long. The smallest spots on the lower leaf surface are darker, less translucent. The inflorescence is usually small and crowded. The flowers are smaller, no more than ⅝″ in diameter. The sepals have straight sides along the tip and have few numerous black glands. There are numerous amber to black dots all over the petals, not just near the margins. 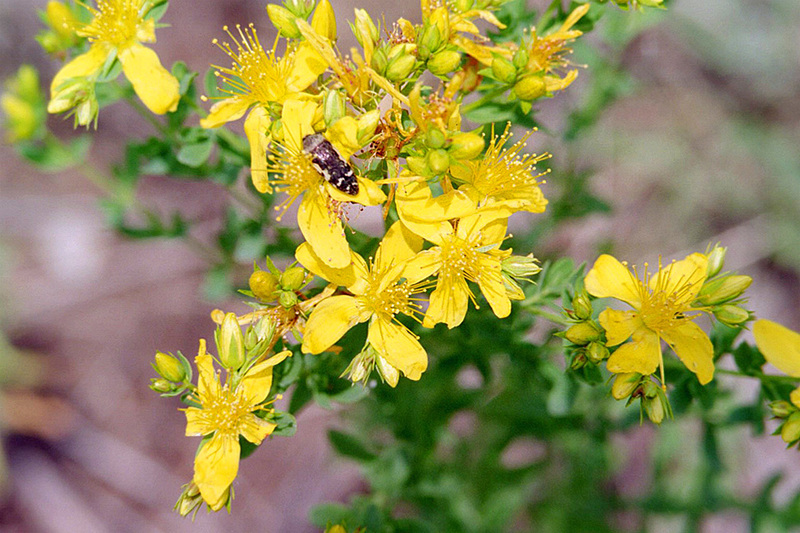 Pale St. Johnswort (Hypericum ellipticum) has erect, unbranched stems arising from a rhizome with a few flowers at the end of the stem. The leaves are elliptical. The flowers are pale yellow. The common name refers to the blooming period. 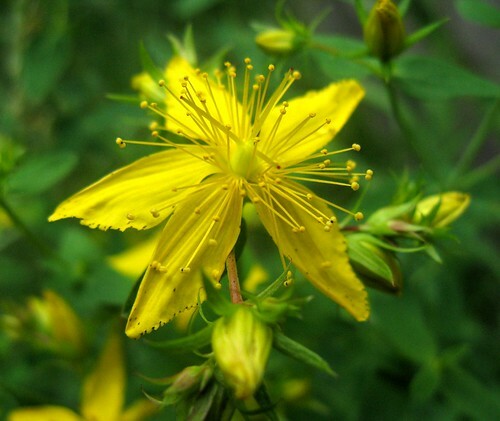 The plant is usually in bloom on June 24, St. John’s Day. Gradually tapering with concave sides to a sharply pointed tip. 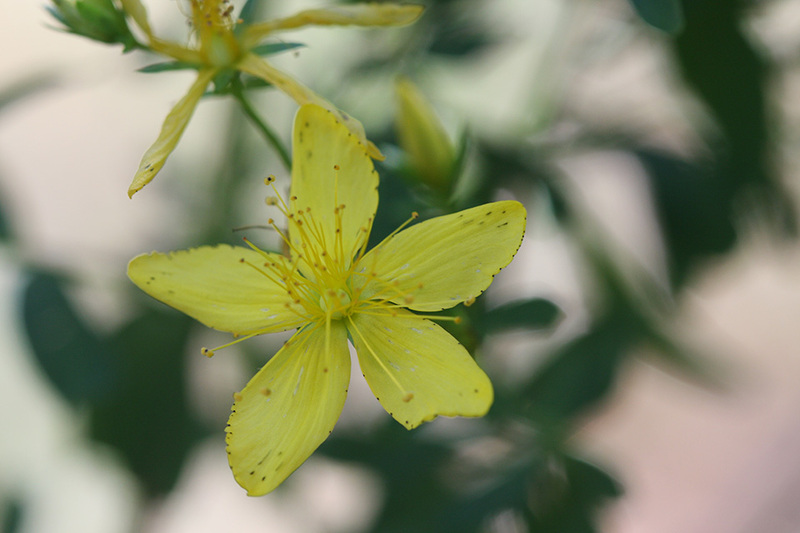 In plants, the portion of the female part of the flower that is receptive to pollen. In Odonata and Hymenoptera, a blood-filled blister or dark spot at the leading edge of each wing toward the tip, thought to dampen wing vibrations and signal mates. In Lepidoptera, an area of specialized scent scales on the forewing of some skippers, hairstreaks, and moths. 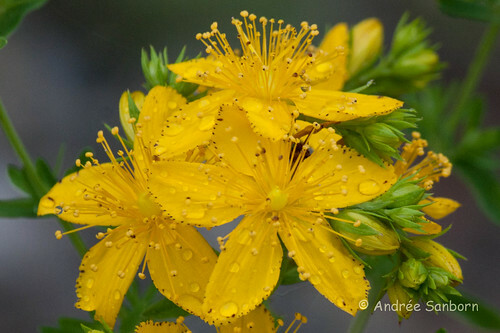 Perforate St Johns Wort (Hypericum perforatum). 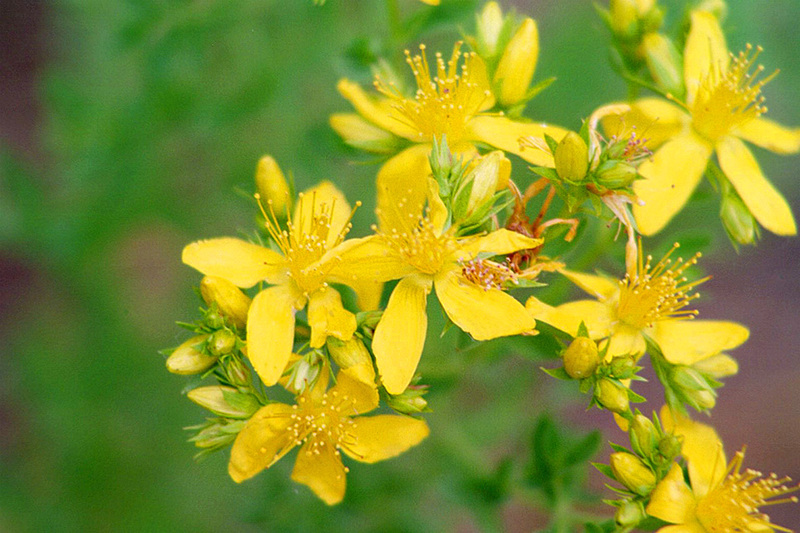 St John's wort is the plant species Hypericum perforatum, and is also known as Tipton's weed, chase-devil, or Klamath weed. 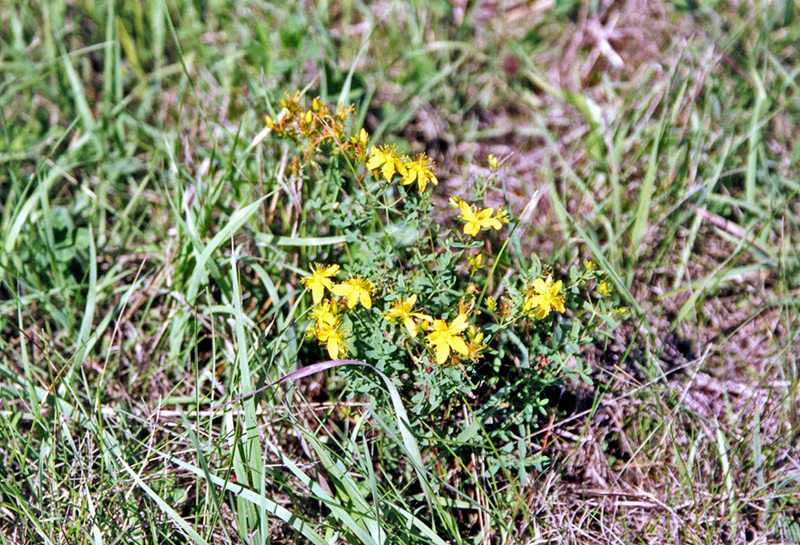 Het Sint-Janskruid (Hypericum perforatum) is een plant uit de hertshooifamilie (Hypericaceae). HD Video ... MUSIC : Adam Drake "Summer Meadows" On l'appelle aussi « herbe aux mille trous », ce qui explique son nom (mille perforations) et fait partie de celles qui ont droit à l'appellation « herbe de la Saint Jean », car il est en fleurs à cette date de récolte importante pour les herboristes. En Auvergne, on le nomme « chasse-diable » suite à son utilisation dans l'aspersoir d'exorcistes. On le rencontre un peu partout où il a suffisamment de lumière (prés, bords de chemins, berges, clairières) de la plaine jusqu'à l'étage montagnard (1800 m) où il fleurit au mois de juillet.